With its ever-growing number of resources and demand in the industry, front-end development is becoming an attractive career path for many. However, aspiring programmers still struggle to start, not knowing where to exactly begin. Luckily, the industry is filled with many professionals more than willing to share tips and their experience. Mindaugas Jačionis is definitely one of those guys. 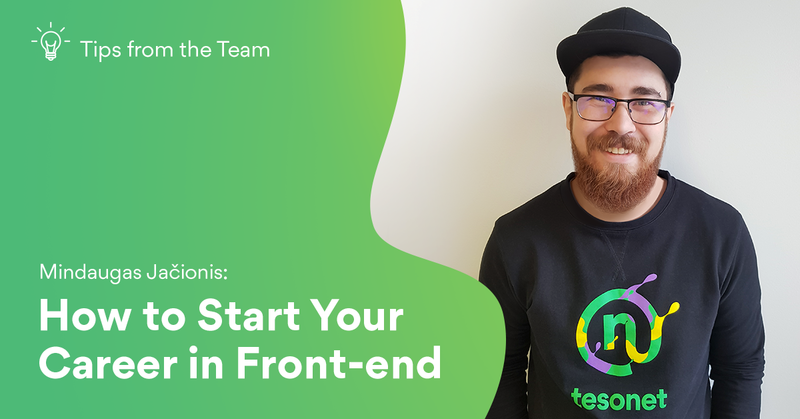 When he’s not a senior front-end developer at Tesonet, he teaches at Coding Academy and shares his expertise with others. This time, he’s giving advice on how to start a successful career in front-end. How did your story with programming start? Everything started when I was a teenager playing video games. I was really curious how someone could create visuals like that and started looking into it. That’s how I learned about programming, coding and front-end. And, as they say, the rest is history. Since I found the whole thing really interesting, I decided to join “Young Programmer’s School” and even started taking extra informatics classes in high-school. After high-school, I continued my studies at a university, but honestly, it was more difficult than I was expecting. It almost led to me quitting programming. Fortunately, I met a few great professors outside my university that really inspired me not to give up and continue with programming. Why front-end and not, let’s say, back-end development? With so many different resources around, many are struggling to understand how to start their own career. Where should they begin? You begin from the start (laughs). No, but seriously – the possibilities are truly endless in programming. So the first thing you need is to work on narrowing down the list. You can’t really make your decision just from thin air, so I always recommend trying to build a website from scratch. Doing that, you’ll soon see whether you have more patience to work on front-end or back-end. And then you narrow down your choices even more. The more different things you try out, the sooner you find where you want to excel. The beginning is the best time to experiment. Ok, this sounds like a lot of work. Well, it is. That’s why everyone says that great developers need patience – just figuring out where you want to start your career is a big challenge itself. So, besides patience, what are the other things aspiring front-end developers need to succeed? Being precise and paying a lot of attention to detail is mandatory here. As a front-end developer, your top priority has to be making sure that everything looks and works great. You can’t really skip this part. Also, something that applies to all the aspiring developers, is continuous learning. No matter how much experience you think you might have, learning and practising is a part of your daily routine. Trying out new techniques, working with different technologies, solving various problems – this is a never-ending process. It’s a hard work, but that’s the only way you will succeed. Even I am learning every day – for instance, I started teaching at Coding Academy partially because it’s a good learning experience for me too. Students sometimes ask questions about things that I don’t usually think about. So, it’s a great opportunity for me to really work on understanding how the basics work and why. But when we talk about continuous learning, it’s not just about learning the basics. What about all the new things that are happening in the industry? That’s true, it’s important to know your basics but you need to be up to date with current trends as well. I wouldn’t say you need to jump on the bandwagon and instantly pick up a new technology. That would get you nowhere. It’s important to find the right balance – always evaluate whether you really need to invest a lot of your time or just being aware of something new is enough. You also have to think about the industry you’re working in right now or you want to work in the future. If it’s a more open environment, you’re likely to have more freedom to pick up new things to try out at work. But if we’re talking about a more “traditional” environment, for example, banks that use older but trusted technologies, there’s a smaller chance for experimenting. What are the biggest stereotypes that people have about front-end? Another important thing to understand is that front-end developers are not designers. They need a bit of design knowledge to effectively communicate with designers, but they are just executing designs and not creating them themselves. What are some of the resources you would suggest checking out for beginners in front-end? I think the more you immerse yourself in this community, the more you learn. Especially when you’re an aspiring developer, all the meetups and gatherings are a quick and easy way to get used to the community and soak up as much information as possible.